To help celebrate the end of school, I declared the day before the last day to be "Bring Your Sister To Work With You Day." I cleared it with my principal beforehand. My sister is my best friend, and I've told my students lots of stories about her over the course of the school year. So, they've been begging to meet her for months. Since she is in college, her semester ends a week or two before ours. This allowed her the opportunity to come and visit. My kids were amazed by my sister. The look on students' faces as they walked in the room and saw my sister and me was priceless! Some even mistook her for me. Are you guys twins? Nope, we're three years apart. This is so weird! You guys even sound the same! Though, one student said that my voice was a little higher than my sister's. And, another student in a different hour claimed that our voices were almost the same, but my sister's voice is a bit higher than mine. I'm not sure who to believe. We also heard from multiple students that we have the exact same laugh. That's good to know. Another student claimed, in amazement, that we also dress alike. The fact that they had to call us Ms. Hagan was almost too much to handle. One class decided to differentiate between us by calling me Ms. Hagan 1 and my sister Ms. Hagan 2. My sixth hour referred to my sister as Ms. Hagan and myself as Ms. Nagah (which is Hagan backwards, by the way!) My fifth hour wanted to refer to me as the original Ms. Hagan, but that implied that my sister was the imposter Ms. Hagan which did not go well. :) Then, there was the student who decided they should just rename us Tweedledee and Tweedledum. When she suggested that I could be Tweedledum, I asked her what she was implying. Overall, it was fun to introduce them to my sister. Though, I'm pretty sure that they like her way better than they like me. She didn't just come and visit. She also brought a project to do with my kiddos. Lots and lots of circles. Hundreds of them! She also brought curling ribbon and equilateral triangles cut out of white card stock. She brought some glue sticks, and I also retrieved some from my cabinet. While waiting for school to start, she made me several tiny origami flappy birds. Sadly, the wings of the tiny flappy birds barely flap. But, they were still cute! Our project for the day was to make an icosahedron ornament ball. My sister and I both made these for the first time as 7th graders in Mrs. Seller's Pre-Algebra class. We made ours out of recycled Christmas cards. Here, some students proudly display their finished products. After folding lots of circles/triangles, the students glue them together to form an ornament ball. Here are the icosahedron ornament balls in the process of being assembled. Here are some ornament balls that my students completed. So, how do you make your own? If you're only making one, you could probably get by with cutting out your circles by hand. Each icosahedron ornament ball takes 20 circles. My sister used a circle punch to punch out her circles and save her sanity. She used a 2 1/4" circle punch, but any size circle will work. Larger circles will produce a larger ornament ball. Circle Punch - An Amazing Tool! She punched the circles out of random leftover scrapbook paper and these booklets of photo mats that she picked up at Wal-Mart for around three dollars. The small size made manipulating the punch much easier. You're going to need to cut an equilateral triangle template whose points rest on the edge of your circle. Lay the template on top of each circle and begin folding over the edges. After folding over two of the edges, it is usually easiest to remove the template before folding over the final edge. This reduces the chance that your triangles will not match up when gluing. Two Down - One to Go! A small gap in the center of triangle is fine. Gaps on the vertices of the triangles are bad. Pretty soon, you'll have a pile of triangles. Remember, you need 20 of them! My sister made two partial pieces to demonstrate the construction process to my students. I thought this was a brilliant idea. She's going to definitely make a great art teacher! First, students need to take five of their triangles and glue them together to form a dome. You are actually going to need to make a dome for the top of the ball and a dome for the bottom of the ball. The top dome needs a curling ribbon hanger. Take a piece of curling ribbon, knot it, and place it in the center of the dome before gluing the last two triangles together. We had lots of different colors of curling ribbon to choose from. The bottom dome is created in the same way, just without the ribbon. After using five pieces to make the top dome and five pieces to make the bottom dome, you should have ten pieces left. Glue these ten pieces together, inverting every other triangle, so that the pieces form a line with a flat top and flat bottom. Here, my sister glued five pieces together to demonstrate the process to the class. At the end of the day, we took my sister's sample pieces and added more pieces to form a complete ball. Here's the top and bottom domes. And, here are the ten pieces that will make up the middle of the ornament. The best way to go about this next step is to turn over your long strip of triangles and apply glue to the top or bottom of the strip. Then, begin attaching each piece with glue on it to a section of one of your domes. Then, add glue to the remaining pieces and attach the other dome. Here's a picture my sister snapped of me in the process of gluing my icosahedron ornament ball together. Here are pictures of my finished ornament! So pretty! By the end of the day, I had gained a collection of left behind ornament balls in the back of my classroom. Well, I guess one of these was mine and one was my sister's, but the rest of them were student creations that didn't make it home. If you wanted to make this more math-related, you could have students cut their circles out of colored cardstock and decorate each circle to reflect something that they learned this year. I'm pretty sure that's not an original idea. I thought I saw it on Pinterest once, but I can't find it. You could take Tina Cardone's Fan Posters Project and turn it into Fan Icosahedron Ornament Balls. Pass out circle templates and have each student write affirming statements about their classmates on a circle. Sort the circles by student. Then, have the students assemble their own ornament ball that is covered with words about them. Maybe students would be more likely to keep them if they were customized? I ended up giving all the leftover ornaments to one of my students who is going to use them to decorate her bedroom. I could also see this as a culminating geometry project. Each triangle could be decorated with a different theorem? Or geometric vocabulary word and illustration? Perhaps this could be turned into an activity of geometric construction? Use a ruler and compass to construct the necessary pieces without a template? Summer is already in full swing. We've been out for a couple of weeks now. The end of May has been filled with VBS prep, Friends of the Library Meetings, prom fundraising, and time spent with family. Now that May is already over, I'm looking over my calendar to see just what I'm going to be busy with these next two months. School starts back August 14th with two professional days before that. But, I've got a ton to do before then! * Vacation Bible School (5 Days) - This will be my 3rd year directing my church's VBS. Our theme this year is River of Life. VBS is a huge undertaking, but I love getting to interact with the kids. Plus, I get to exercise my creative side with decorating and crafts. * Story Hour at the Drumright Public Library - I'm pretty sure this is proof that I'm crazy or I just can't say no. Well, actually, I volunteered to run the very first story hour at our local public library. We're going to be reading If You Give A Pig A Pancake and making a fun pig-themed craft. * TU School of Urban Education Breakfast and Brainstorming Session - My alma mater is inviting recent education graduates back for a breakfast to share our teaching experiences and insights on what works in our classrooms. * Monthly Book Chat - My public library has a monthly book chat that is one of the highlights of my month. What could be better than spending an hour eating dessert and talking about the books we've been reading. * Tulsa Math Teachers' Circle Summer Immersion Program at Post Oak Lodge (3 Days) - I'm very excited for Math Teachers' Circle Training this summer! It will be three jam-packed days of math problem solving, hiking, swimming, and hanging out with other math teachers! I've had a blast at the Math Teachers' Circle Meetings I've attended this past school year, so I'm looking forward to the immersion program! * Oklahoma Council of Teachers of Mathematics Summer Conference (1 Day) - This will be my second year attending this conference and my first year presenting! I'm excited to share with Oklahoma teachers about "Making Note-Taking Fun and Interactive: An Introduction to Interactive Notebooks." * Oklahoma Geometry and Algebra Project (OGAP) Workshop (5 Days) - Of all the workshops I attended last summer, OGAP was the one that I learned the most at and had the most fun at. After five days, none of us wanted to leave! We each made a two-year commitment to this workshop that focuses on preparing teachers to teach Common Core high school math courses. Last summer, I attended the Edmond Workshop. But, due to scheduling conflicts, I will be attending the Broken Arrow/Tulsa Workshop this summer. I'm going to miss getting to reconnect with the teachers from last year, but I'm excited to network and make new connections this summer! I've used so many ideas this past year from last summer's workshop. I'm hoping to blog about more of the activities and workshop this summer. * Friends of the Library Board Meeting - I'm Vice President of my local Friends of the Library Board of Directors. My landlord is the President, and she reached out to me to help form a Friends of the Library Group. We just started this year, and so far we've planned a monthly Senior Book Day and a bi-monthly Children's Story Time. * 4th of July Trip with my Family - I'm not sure where we're going yet, but my parents are closing down their business for the 2nd - 4th for Independence Day. This gives us 5 days (including the weekend) to go somewhere. As small business owners, they have a terrible time taking off during the year. They've found that they only way to take a vacation is to just close the business down for a few days. * Church Camp at Kiamichi Baptist Assembly Campgrounds in Talihina, OK (5 Days) - This will be my 15th year to spend at a week at KBA. I went as a camper for the first time the summer after I finished the 4th grade. After three years as a camper, I started going as a junior sponsor and eventually a sponsor. This is a beautiful place that is very near and dear to my heart. * Twitter Math Camp (4 Days) - I am so, so, so excited to finally get to attend TMC! After reading about it for the past two years, I'm ready to be part of the action! I'll even be presenting a session! * OK Math Convening (3 Days) - This will be a new experience for me. A group of math teachers from across Oklahoma will be convening in OKC to create tools and resources for all of Oklahoma's teachers. We're supposed to be thinking about what we want to create to share with others. I've got so many ideas. Hopefully, I'll be able to narrow my focus by the end of July! As you can see, this is going to be a busy, busy summer! There were several workshops that I would have loved to participate in this summer, but I couldn't due to schedule conflicts. I need a summer that is twice as long so I can fit in all the activities I want to participate in. This post doesn't even begin to touch all the things I'm planning on doing this summer outside of scheduled activities. But, that's an entirely different post! The first lesson I implemented from the OERB Core Energy Mathematics Workshop I attended was on Oil and Natural Gas Production Profit. I did this lesson with my Algebra 1 students as a review of writing equations based on a real-life situation and as an introduction to solving systems of equations. I modified the worksheets we were given at the workshop to create two foldable booklets that could be glued in our interactive notebooks. I was hoping to get through both booklets in one 50-minute class period, but that was super optimistic. In reality, it took 1.5 class periods to complete these problems. Before jumping into the lesson, we had a group/class discussion. What do you know about the oil and natural gas industry? I had students discuss their own personal knowledge in groups. Then, each group shared with the class. I really need to work on my discussion leading skills because the discussion was not as fruitful and productive as I would have liked. My students think they can get away with having their own conversations while other groups are presenting. And, I end up yelling a lot. But, it never seems to do any good. I think it's because I've never taken the time to teach them the procedures of a class discussion. I need procedures. I need consequences. And, I need to be consistent about them from Day One. I just ordered a book on orchestrating productive mathematics discussions , so I'm hoping to learn from that this summer. Some students offered insights into the oil and natural gas industry that were way over my head. They were throwing around jargon that meant nothing to me. These were the students who have actually spent time on rigs and worked out in the field alongside family members. Other students offered insights such as "Oil smells funny." or "You put gas in your car." The Essential Question for this lesson was "How do oil and natural gas producers determine if wells are feasible to drill?" Students were to come back and answer this question AFTER completing the lesson. We also needed to review some important vocabulary before beginning to work with numbers and equations. As we worked through each of the questions together as a class, we would continually refer back to this vocabulary box. If a question mentioned profit, we would review the definition of profit before even attempting an answer to the question. These terms were new to almost all of my students. They had a really hard time differentiating between operating costs, profit, and revenue. This could be updated to reflect the actual current selling price of a barrel of oil, but I just used the data that was provided at the workshop. Oil prices tend to fluctuate a lot. After reviewing the vocabulary, students were able to complete this section with relatively few problems. The function notation proved tricky for several of my lower level students. Many students would just wait until someone in the class provided the answer. I hate this, but I'm not sure what to do about it. I guess I could give everybody in the class a different set of data to work with, but that would probably drive me INSANE! Having written functions for revenue and operating costs, students could now tackle the topic of profit. This is where we ended Day One. Day Two. Your company is now ready to drill a well! Now, we've moved from discussing one wellsite to comparing two wellsites. Again, we're practicing function notation. This time, students are told what to name their functions. Now comes the fun part. Graph the two functions. Figure out where they cross. This was really hard for me to do, but I did it anyway. I didn't tell my students how to number their axes. I let each class pick. I was risking that some classes might not find a graphical solution. Why do this? Well, this is math. This is real-life. In real-life, every decision has consequences. My students need to learn this. They need to learn that math isn't always pretty. It can be messy. Sometimes you have to try multiple approaches to something before you find the way that works. Handing my kids a graph with the axes already marked cheats them and me out of a learning experience. My kids need to see the consequences to their decisions. If I choose for them, I'm cheating them out of an opportunity to think critically. To be an effective teacher, I need to know what my students are thinking. I need to know how well they can think critically. If I choose for them, I'm cheating myself out of learning more about where my students are. The more I know about where my students are, the more I can help them get to where they need to be. In this class period, students decided to let each line on the y-axis represent $1,000. And, each line on the x-axis represented 5 days. We started to graph A(x), the cost of drilling wellsite A for x days. My students quickly identified the y-intercept of the equation, and we marked that on our graphs. The slope was a little trickier. How in the world do you graph a slope of 200? First, I asked my students to rewrite 200 as a fraction. 200 was soon expressed as 200/1. The numerator of our slope represents the change in y of our function. What is the change in y of our y-axis? The distance between each line on our y-axis represents $1,000. The denominator of our slope represents the change in x of our function. What is the change in x on our x-axis? The distance between each line on our x-axis represents 5 days. Now, how can we "unreduce" our slope so that the numerator is a multiple of $1,000 and the denominator is a multiple of 5? Students soon realized that 200/1 is equivalent to 1000/5. Instead of spending a ton of time trying to estimate how to go up 200 dollars and over 1 day on the graph, we were able to quickly and efficiently move up 1000 dollars and over 5 days. This is a strategy I learned at the OERB workshop. This was a completely new strategy to me, and I kinda sorta fell in love with it. We're always asking our students to reduce the slope. But, I don't think I've ever asked students to "unreduce" their slope before this lesson. I let the students take more charge on graphing B(x). Again, we had to "unreduce" our slope of 250/1. This class ended up multiplying the numerator and denominator by 10. Going up 2500 dollars and over 10 days was a little trickier since every other dot was not on the intersection of two grid lines. In retrospect, we could have corrected this by multiplying the numerator and denominator by 20. We found the point of intersection of the two graphs and wrote this solution to the system as an ordered pair. Next, I asked students to algebraically determine the solution. Since we were only beginning our study of systems of equations, I had to basically set up this problem for my students. Once I set up the equation, they were able to easily manipulate the variables to solve for x. Finding the corresponding cost by substituting the found value of x into one of the cost functions did not occur to them. Next, students were required to write exactly what this found ordered pair meant. My students struggled with the writing which is proof that I need to require a lot more writing in my classroom. With Common Core, my students need to get used to justifying their answers. Even more, they need to get used to writing in complete sentences. Always using units. Showing their work. We've got a lot of work to do! This is the first extended application problem that I have worked through with my students. I enjoyed the process, and I learned a lot. I hope my students learned a lot, too. Their answers to the essential question were disappointing. But, I think that's mostly my fault for just expecting them to write when I haven't required that of them for the entire year. My students will rise toward my expectations. But, first I must set expectations. This is one of the major things I am working on for this summer. Procedures and expectations. Clearly spelled out. Practiced Daily. I have uploaded the files for this activity here. Credit for the lesson goes to the OERB. I have slightly modified some of the wording and structure to make it work for my students. Several months ago, I had the opportunity to attend a free OERB Energy Education Workshop at Ponca City High School in Ponca City, OK. This was my second OERB Workshop to attend. I attended my first OERB Workshop just a couple of weeks before I started my first year of teaching. I blogged about that experience here. OERB stands for the Oklahoma Energy Resources Board. They are funded by a voluntary tax paid by oil and natural gas producers and energy owners. They are known across the state for cleaning up abandoned oil well sites at no charge to the landowner. They also seek to educate children about oil well safety. And, they provide a free curriculum to teachers that relates their subject matter to the oil and natural gas industry. Oklahoma teachers can sign up to attend a free workshop here. They have workshops from pre-K through high school. One of the first questions my workshop facilitator asked was, "What role does oil and natural gas currently play in your life? How much do you know about the oil and natural gas industry?" To be honest, I spent many years of my life really not thinking about the oil and natural gas industry. Yes, I drive a car. And, I know it couldn't run without petroleum products. But, I never gave much thought to how that oil gets to the store or the gasoline gets to the gas station. Then, I moved to Drumright. You wouldn't think that moving 60 miles west of the area I grew up in would make that big of a difference. But, a lot of days, it seems like I'm living in a whole different world. I grew up east of Tulsa. There are farms and ranches. But, most people work in either Tulsa or its suburbs. I don't ever remember a single classmate announcing that they planned to go to work in the oil field. Drumright began as an oil boomtown. Oil was struck in 1912, and the town sprang up overnight. It is impossible to spend anytime in this town and not realize just how important oil is to its existence. Our newspaper is called The Drumright Gusher. Our school yearbooks are also known as Gushers. Our community theater is the BoomTown Theater. Drumright is the smallest town in Oklahoma with a community theater group. You can spend the night at the BoomTown Inn. Our population is right around 3,000 people. We're also a zero stop light town. Even our town celebrations and festivals are centered on oil. You can attend Drumright Discovery Days every summer to celebrate the discovery of oil in Drumright. There's an Oil Patch Jamboree in the fall. And, there's a Summer Oil Patch Festival every Fourth of July. Our high school was built in 1919 when oil production was high. At one point, the high school was graduating classes of 90-100 students. For the two years I have been there, we have graduated only around 32 or so. The town is very attached to this historic building. The road in front of the high school is still covered in the original bricks. To celebrate the town's centennial, an 84 foot tall oil derrick was dismantled, moved into town, and donated to the town's museum. 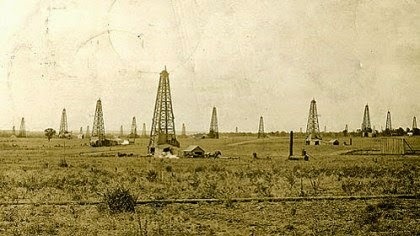 This postcard from 1913 shows how the oil derricks used to dot the Drumright landscape. It's hard to drive anywhere in town without seeing a pumping oil well. This one is just a couple of hundred feet off of Main Street. Additionally, we are less than ten miles from Cushing. Cushing is the Oil Pipeline Crossroads of the World. Cushing is also home to the world's largest tank farm. They have the capacity to store over 66 million barrels of oil. President Obama even visited the town in 2012 to make a speech about the Keystone Pipeline. Why am I telling you all this? Well, the oil and natural gas industry is a major part of the town I live in and teach in, and it's a major part of my students' lives. When I ask my students how many of them have at least one family member who works in the oil field, 90-95 percent of hands will go up. Oil is everything in this town. A lot of days, I wish this wasn't the case. So many of our students set their sights on working in the oil field. After all, that's where their parents, aunts, uncles, and cousins work. It's all they know. My heart breaks every time I hear a student tell me that they don't even really need a high school diploma since they're just going to work in the oil field. When colleges are a minimum of 45-60 minutes away and the oilfield is 5 minutes away, the oilfield seems to win out way more than it should. I have had a coworker tell me that the students in this town don't need Algebra 2 because their destiny is the oil field - not a job as a rocket scientist. Comments like this make me livid. I want my students to have a vision beyond the oil field. I want them to go to college and THEN decide if the oil field is the right fit for them. Oil field workers are important. But, I don't want students thinking that is their only option. The first time I attended an OERB Workshop, my main intention was to get free supplies for my classroom. This is how I got a free class set of 30 TI-30 Scientific Calculators. They've been used in my classroom almost every single day since I got them. This time, I was still eager to get free supplies. But, I'd also gained a new appreciation for the industry. I'd lived in Drumright for less than a week when I attended the first workshop. After living there for almost two years now, I have a greater understanding of the importance of oil to this area that I now call home. The new Common Core aligned curriculum that they would provide me with would be applicable to my students. These lessons would give me a chance to show my students how math plays out in real life in an industry that they are almost all familiar with. The lessons weren't fluff. They were relevant. We each received a binder of curriculum materials. I attended a training that was specifically for high school math teachers. We worked through each of the lessons together. And, I fell in love with them. I could actually see myself using these lessons in my classroom. We wrote systems of equations to compare the costs and profits of various oil wells. I solved the problem algebraically before solving it graphically. Then, I couldn't get my graphical answer to match my algebraic answer. I wrote myself a reminder to let my students struggle with graphing the system by hand first before introducing them to the technology that can find the solution for them with a few keystrokes. Another lesson had us performing linear programming. This is a topic that I've never actually taught before. We used the pythagorean theorem and/or distance formula to calculate the cost of drilling. We looked at a chart of Oklahoma Oil Production to identify areas that looked as if they could be modeled by quadratic, cubic, and quartic functions. Then, we used the data to perform the selected regression. They emphasize that the supplies are our own personal property, not the property of our school districts. So, if I move, I get to take my calculators with me! Laminated mats for some of the activities. Vis-a-Vis markers to use to write on the laminated mats. Books about the oil and natural gas industry. Dvd documentaries about the oil and natural gas industry. Pencils. You can't have enough of these! Rulers. My students have a bad habit of bending rulers and accidentally snapping them. These are much needed! And the best part? Three TI-84 Plus Color Graphing Calculators and a Charging Station! This box is just a little slice of math teacher heaven. Calculators. Pencils. Rulers. Protractors. Graphing Calculators. Graph paper. Dry erase markers. Colored pencils. A storage tub. Since I'm writing this months later, I can say that I've used several of the OERB lessons with my students. More posts on that later, though. To the OERB - thanks for the resources you have provided for my students. And, thank you for giving me the materials I need to show my students that math plays a role in the oil and natural gas industry!